They say that we are what we think. If we think we can do it, we will somehow do it. On the contrary, if we doubt our capability, then we will never be successful. The above mentioned books are all about cricket. Whereas, My Stroke of Luck is an auto-biography. It talks about the fateful stroke that hit the author and his life since then. It recounts how the stroke impacted the author’s personal and professional life. In a subtle manner, it also narrates about the importance of family and friends in one’s life. The book is a little short to 250 pages. And the beauty of the book lies in its simplicity. It is brief, crisp and to-the-point. 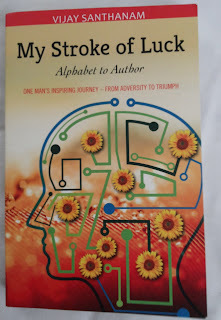 The contents in it are personal and it focuses on the after-effects of stroke in the author’s life. And the genuineness it carries and a child-like innocence that it portrays makes the book a compelling read. Plethora of positive vibes flows through the books. There is a never a moment you sympathize with the protagonist. Instead you watch him progress and evolve. You don’t feel bad that the author had a stroke. Instead you will feel thankful that he didn’t give up. And hey! This positivity is viral. A faint smile will never leave your face when the author achieves little yet important milestones. The process of coming back to normal life is slow yet gradual. And as a reader, you will feel happy that he always tried and was determined. Though the book is under 250 pages, there are some areas where the author has over-explained; especially, those incidents where he starts learning languages. I agree that the book is about Alphabet to Author. But it could have been edited and made it a little shorter. Hey! Worry not... The book will not make you feel bored! I finished the book in one-sitting. I am not a kind of person who completes a book in one-sitting. Not because I don’t have time; but because my mind tends to waver a lot. But this book kept me glued. It made me turn page after page. In short, these few pages straight from the journal of author’s life are full of positivity. When you close the book, you will be happy. This book is all about celebrating the complexity of human brain. It also celebrates the delicious fruits that determination reaps. Instead it would help you to feel thankful for everything you have... It makes you look at the World with optimism and vigor. PS: I heartily thank BlogAdda for sending books for review. This is my 10th book from you in this year and I can’t ask for more. Oops! I thank you for making me read 10 books. I thank you for bringing back the reading habit that I was going far away from me as more and more years passed by. Ouch! Thank you is just a word. Yet, I am a person with limited vocabulary. But I ensure that I will always be an ardent follower of BlogAdda and be a part of your book review program.